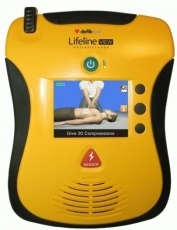 Introducing our new line of AEDs (Automated External Defibrillators). An AED is a portable electronic device that is able to diagnose cardiac arrhythmias and is able to treat them through defibrillation. Defibrillation is the application of electricity which can stop the arrhythmia and allow for the heart to reestablish rhythm. Sudden cardiac arrest is one of the leading causes of death in the United States, and being prepared with an AED can help save a life. Defibrillators are essential items to have in the workplace, school, shopping centers and even your home. You never know when an accident can occur but being prepared is the first step to saving someone’s life. Introducing one of the easiest AEDs to use on the market. Many AEDs can tell you what to do in an emergency, but this is the first one that shows you with video in full motion color. The Lifeline VIEW has a large full-color interactive display that gives you step-by-step instructions for performing CPR, rescue breathing and external defibrillation. 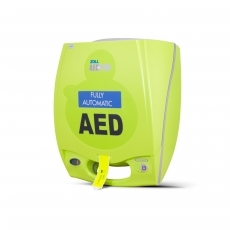 With award-winning design, durability and easy maintenance – backed by the Defibtech commitment to innovation and excellence – we can guarantee you’ve never seen an AED like this before. The Philips HeartStart OnSite defibrillator is designed to help you to help save a life in extraordinary circumstances. Its clean design and clear voice instructions provide the confidence you need when administering therapy to a person in cardiac arrest. Powered by a long-life disposable battery, the HeartStart OnSite tests itself regularly to ensure readiness. 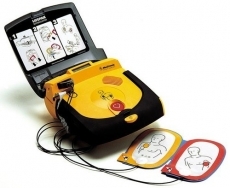 This AED can be used on persons of any age including infants and children. And most important, it’s effective. Its patented SMART Analysis heart rhythm assessment and SMART Biphasic defibrillation therapy are clinically proven in over 10 years of use. 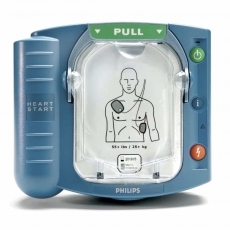 The Physio-Control LIFEPAK CR Fully-Automatic Plus defibrillator combines best-in-class technology with the simplicity and portability required for use by the general public in a sudden cardiac arrest emergency. It puts the advantages and advanced technology emergency medical professionals have come to trust and rely on squarely in the hands of anyone ready to save a life in the event of an SCA emergency.